Note: This article intentionally focuses primarily on Montgomery County athletes. What has typically been among the strongest meets of the indoor season, this year's Private School Invitational at Georgetown Prep School was reduced by nearly half the entries due to the conflict with the Baltimore area private school championship. Additionally, DeMatha sent several of its best athletes to compete in New York City where they clocked a very impressive 3:17 4x400. Good Counsel's Sean Sutton was the star of the day. Sutton, coming off the US #1 34.35 300-meter dash at the Virginia Tech Invitational a week earlier, followed up that performance with a winning time of 34.69, which is the fastest flat track time by a Montgomery County athlete in at least a decade. 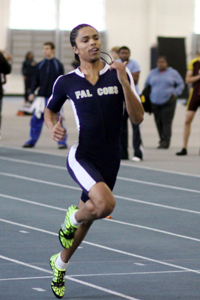 Sutton also ran 6.61 in the 55-meter dash and ran about 49 seconds on the 4x400 relay. The best may be yet to come for Sutton who is entered in the 200 and 400 at the Kentucky Invitational. The Kentucky Invitational takes place on an oversized 300 meter track and Sutton and his coaches believe he can run under 48 seconds for 400 meters, something a Montgomery County athlete has not done in over a decade, indoors or outdoors. There will be more opportunities for fast times on fast tracks against elite competition at the Brooks PR Invitational in Seattle, Washington and New Balance Indoor Nationals in New York City. Also winning an event at the Private School Invitational for the Good Counsel boys was Kyle Martin who has developed into the county's leading hurdler this year. Martin edged out Gonzaga's Jacob Berman in the finals, 7.87 to 7.88. Gonzaga easily won the meet with 105.5 points. Huge chunks of points came from Thomas Lynch and Grey Congo in the shot put, and Collin Liebold and Mike Crozier, who swept the top two spots in both the 1600 and 3200. Georgetown Prep's Russell Hornsby participated in the 4x800 and 4x400 relays, splitting about 1:56 on the 4x800, but opted out of the open 1000m for the sake of not running too many events this soon after rehabbing from an injury. Good Counsel's Afolabi Shokunbi missed the meet due to illness, which slowed down Good Counsel's winning 4x800 (8:17.21), and also watered down the open 1000m field further. The open 1000m came down to a battle between Episcopal's Reid Nickle, who was fresh, and Good Counsel's Thomas Tallerico, who ran 1:57 in the 4x800 relay. Nickle led from start to finish and clocked 2:33.89 while Tallerico was on his tail throughout the race and finished second in 2:35.31. Georgetown Prep sophomore Nick Gruenwald had a breakout day, tieing for the lead in the high jump at 5-10, and jumping 20-00.50 in the long jump. It is certainly noteworthy that DeMatha freshman Michael Francis won the long jump in 22-02.50. Episcopal's Shantel Bingham (8.13) beat out a great field of hurdlers which included Bishop McNamara's Alexis Stroman (8.18) and Good Counsel's Teju Adewole (8.25). Adewole's time was a new personal best and a new county best this season. Adewole got the surprise victory in the open 55-meter dash with a personal best time of 7.30. 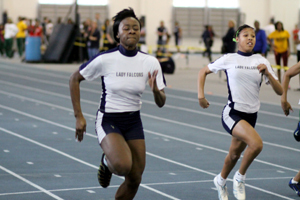 She beat out Elizabeth Seton's Chelsie Stevens and took over the 55-meter lead on the WCAC leaderboard this season. Good Counsel's Lindsay Braviak, while not facing as tough of competition as Adewole, earned her first career victory in winning the 3200 in 13:00.77. Kathryn Scully from Holton Arms did not have much of a challenge in winning the 1600 in 5:31.05. Grace Carr from Georgetown Visitation, who beat Scully a few weeks ago in the ISL Open 1600, also ran the 4x800 relay and finished second in 5:37.85. Natiaha Hinnerichs from Holton Arms won the high jump at 5-02. Kiah Seymour from Archbishop Carroll won both the 300 and 500. Without a doubt the most exciting event of the day was the girls 4x200 relay which saw multiple lead changes between Good Counsel and Elizabeth Seton. With screams bouncing off the walls, Elizabeth Seton charged down the stretch to narrowly edge out Good Counsel, 1:47.25 to 1:47.31. Bishop McNamara, which currently leads the WCAC in the 4x200 this season, was not in the hunt to win the 4x200; however, it won plenty of other events including notable jumps by freshman Jaidlin Hill (17-01.75) and sophomore Brielyn Rogers (37-07). Bishop McNamara won the meet with 106 points.